Another Art Nouveau wallpaper, this time in the delicate styles of Aubrey Beardsley. I started this wallpaper a year (and a week) ago because the original scan of Yuuko reminded me heavily of Beardsley's "The Peacock Skirt". I decided to combine that with an image of Watanuki covered in bandages - converting the bandages to more spider webs. It helped that the bandages were already in a web formation. I dusted this wallpaper off recently because I'm in an Art Nouveau kick and wanted to do something Nouveau that wasn't Alphonse Mucha-styled. I realize now that the timing could not be better - Halloween is next week, and what better wallpaper theme than spiders? Regardless, that's merely coincidence. Not much to say on technique -- just Illustrator and Illustrator art brushes for the spider weaves to save on time. It is really cool wallpaper. 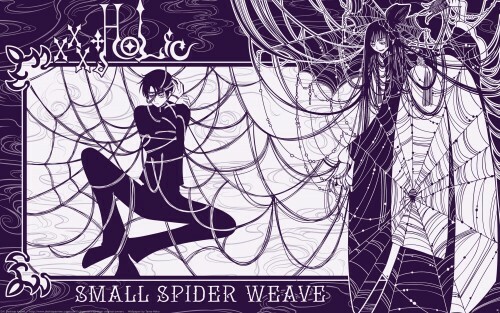 I really like spider web weaving around Watanuki. Looking forward for more of your works. That must've been so insane to do. I admire your dedication. I love the composition as well :D. Amazing work! great job as usual! +fav! damn it that must have took so long to do! awesome! How did you survive vectoring that scan of Yuuko? I'm still working on it for a wallpaper I started a month ago and I wanna die XD The idea for adding Watanuki and changing the bandages to webs was excellent, and when I saw the thumbnail when I was browsing I honestly thought it was a scan of a card or something. The Art Nouveau style fits perfectly with this series, too. And you made it widescreen (I love you! :D ) It's a beautiful wallpaper. This is just insane ! Wonderful job, the vector is flawless. The color combination is also nice. love it. happy you finished it. I love this wall. Monochromatic walls always win with me, and then all that detail, it's pure eye candy. This is so going straight on my desktop. Awesomeness! I like how you did that! That's just the connection Yuuko-san and Watanuki-kun have haha! j/k. Anyhow I really liked how you put it together. Nicely done. That is so amazingly intricate. Woah, nice vector. The picture is unique too.